I admit it: Norbert Davis was American. 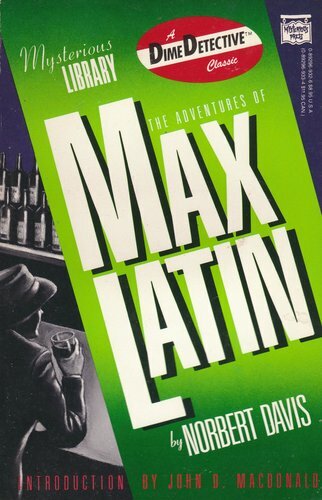 But he qualifies for this blog on two counts: He had a sense of humor, and Max Latin, just one of his creations in a short but busy career writing for American pulp magazines in the 1930s and '40s, had an interesting profession: He owned a restaurant. "Guiterrez came out of the kitchen in a cloud of steam and slapped the heavy metal swing door violently shut behind him. He was a tall man with a dark, bitterly disillusioned face. He was wearing a white jacket and a white apron, and he had a chef's hat crushed down over his right ear. There was a towel wrapped around his neck, and he wiped his forehead with its frayed end, glaring at Latin. "`What was the matter with it?' he demanded." You're a sterner reader than I if you can resist that. Mr. Thrilling Detective Web Site, Kevin Burton Smith, will discuss Norbert Davis as part of a panel I'll moderate at Bouchercon 2015 in Raleigh, N.C., called "Beyond Hammett, Chandler, Spillane, and Macdonald." The panel happens Thursday, Oct. 8, at 2:30 p.m.